EmbedPlus now supports YouTube's native localization/internationalization for standard embeds with our WordPress Plugin. This will set the player's tooltips and default caption track from English to your desired language, depending on the availability. The plugin automates this as a global setting for all your YouTube embeds based on the current language of your blog, as defined by the core WordPress function get_locale. All you have to do is just check a box on the plugin's settings page and it will seamlessly use the language returned by the function. Watch the video below to see the process in action. 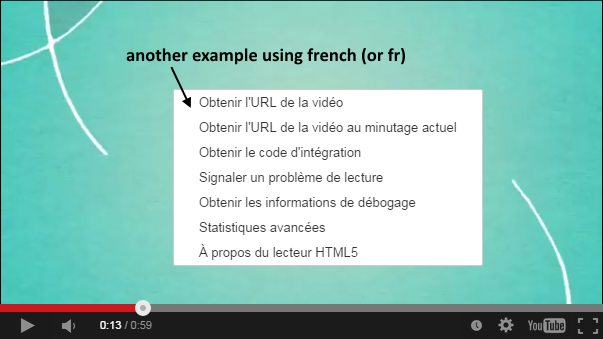 It converts an embed from English to Français. Below, we provide a list of languages that are currently supported by the player. The ISO codes are included also; however, you don't have to worry about them now that we've automated the conversion.